18k Gold with Palladium alloy custom wedding ring, this ring has the look of tension but is actually supported by the custom hand made 14kt yellow gold screws. The Aquamarine is too fragile of a stone for a true tension setting. 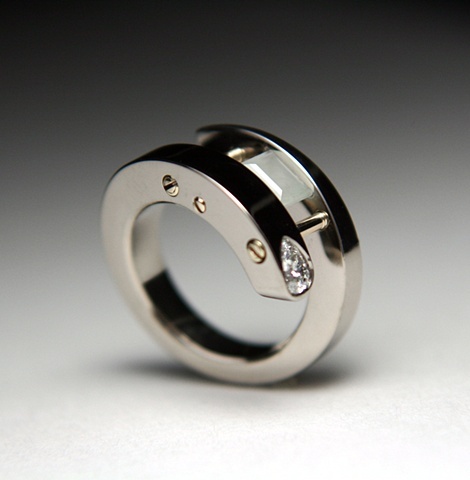 Each end of this ring has a diamond flush set in it. One is a pear shape and the other square cut diamonds. The beveled edge tapers from on end of the coil to the other to tie together the two stone shapes. A truly unique ring.